The concept of Demand Response (DR) generally concerns methodologies, technologies and commercial arrangements that could allow active participation of consumers in the power system operation. The primary aim of DR is thus to overcome the “traditional” inflexibility of electrical demand and, amongst others, create a new powerful tool to maximize deployment of renewable energy sources as well as provide active network management solutions to help reducing the impact of limited grid capabilities. DR allows consumers to actively participate in power system operation, thus bringing new opportunities in emerging energy markets as well as tangible system benefits. In this sense, DR is considered one of the key enablers of the Smart Grid concept. However, DR also poses a number of challenges, particularly when “active demand” is connected to the Low Voltage network, thus affecting all the actors involved in the electricity chain. This book presents for the first time a comprehensive view on technical methodologies and architectures, commercial arrangements, and socio-economic and regulatory factors that could facilitate the uptake of DR. The work is developed in a systematic way so as to create a comprehensive picture of challenges, benefits and opportunities involved with DR. 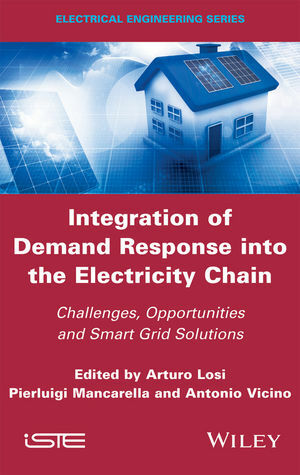 The reader will thus be provided with a clear understanding of the complexity deriving from a demand becoming active, as well as with a quantitative assessment of the techno-economic value of the proposed solutions in a Smart Grid context. Many research contributions have appeared in recent years in the field of DR, both in journals and conference proceedings. However, most publications focus on individual aspects of the problem. A systematic treatment of the issues to be tackled to introduce DR in existing electricity grids, involving the extended value chain in terms of technical and commercial aspects, is still missing. Also, several books have recently been published about Smart Grid, in which there is some mention to DR. However, again while DR is seen as a key pillar for the Smart Grid, there is no dedicated, comprehensive and systematic contribution in this respect. Arturo Losi, Professor of Power Systems, Dipartimento di Ingegneria Elettrica e dell'Informazione "M. Scarano", University of Cassino and LM, Italy. Pierluigi Mancarella, Lecturer in Future Energy Networks, School of Electrical and Electronic Engineering, The University of Manchester, Ferranti Building, Manchester, UK. Antonio Vicino, Professor of Control Systems, Dipartimento di Ingegneria dell'Informazione e Scienze Matematiche, Università di Siena, Italy.